Engagement sessions are so much fun to do. The process of documenting and sharing a couple’s journey together is a pleasure. Our team is blessed with the most beautiful light at Los Angeles Arboretum and Botanical Garden and Pasadena for our wonderful couple – Nathan and Vanessa. We started our session at Arboretum, embracing their love of the outdoors, and of course each other. 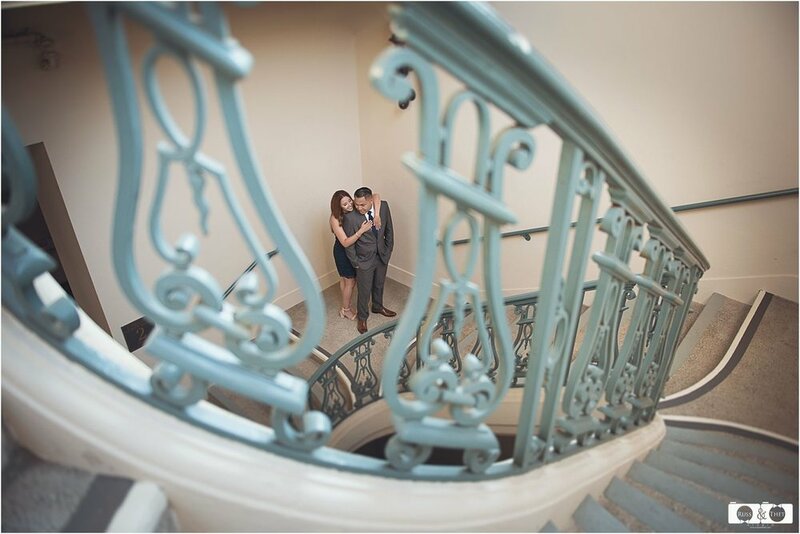 We kept the shoot simple and prop-free but capturing the romance in it. We were lucky to have warm weather and a setting sun which gave us pockets of lights within the leaves and the trees which are vibrant and in full glory. They were both naturals in front of the camera and needed little direction from our team. We explained that we are looking for- basically for them to be themselves and we had already asked them to come armed to be affectionate with each other. No reminder needed! It was just down to me and Thet to choose our background and composition and work with the gorgeous light. Our next snapping site was in the heritage of early downtown charm and historic alleyways with architectural accents of Pasadena. No fussy props or fancy location. Our couple was effortlessly, epically, head-over heels in love. We just capture the natural connection between Nathan and Vanessa and with such a simple back drop; this is an effortlessly romantic engagement shoot. Every looked showed their love in their eyes – from the first time they met at downtown Fullertown until the present. Their eyes locked and just beamed at each other. It was really special. Nathan and Vanessa were super relaxed and have a lovely and fun relationship. We are looking forward to shoot your wedding; it will be sooner than you think. Here are few of our favorite images from our session of natural beauty of Vanessa in her smiley smile and our handsome police officer – Nathan.